Wrapping beautiful presents for the holidays can create a lot of trash, thanks to all of the paper, bags, bows and ribbons. They may look amazing sitting under your tree for a few days, but within seconds of being opened, the garbage bags quickly fill up. Gift wrapping is one of the most wasteful parts of the holiday season, but it doesn’t have to be that way. You can actually wrap beautiful presents without creating a ton of trash; you just have to use the right materials. If you look around your house, keep your eyes open at work, pull from the recycling bin, hit up a thrift shop and visit your local craft store, you can find the perfect items to wrap your presents in a zero-waste manner. The perfect idea for last-minute wrapping paper, newspaper is a material that you can easily find in the recycling bin at home or work. Use the comics section or advertising circulars to add a little color, or stick with the traditional black and white print. Either way, this option gives new life to a material that usually finds its way to the trash just as quickly as store-bought wrapping paper. You can also use magazines, old books, vintage maps or sheet music to wrap your gifts. Upcycling paper for gift wrapping is an idea that can’t go wrong. Another material that you will find in most recycling bins, paper grocery bags give a little texture to your gift wrapping, and this material can be easily dressed up with embellishments. Even if there is a logo on the bag, you can still use it. Simply take an old Christmas card and place it on the spot you want to cover. With some sewing scraps, old button-down shirts, cloth napkins or scarves from a thrift shop, you can make your gift wrapping zero-waste by using fabric. There is actually a Japanese fabric wrapping technique called furoshiki, which embraces an eco-friendly philosophy by folding and tying cloth in a unique way. 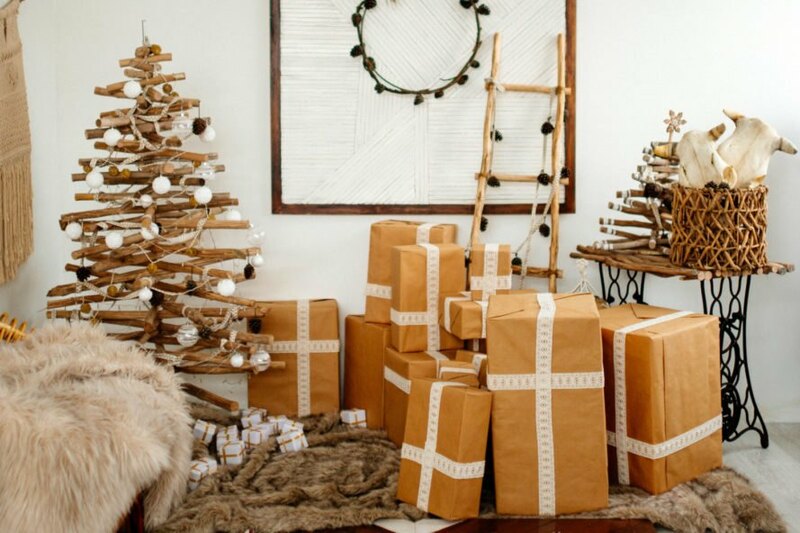 White or brown butcher paper makes perfect wrapping paper because you can easily make it jazzy or keep it plain. Plus, it is never in short supply. You can find it in a recycling bin, or visit your local craft store and find rolls for cheap. Instead of filling up a gift bag, consider using glass jars to “wrap” your gift. You can dress up the jar with some old fabric or ribbon, and the recipient can reuse the jar instead of tossing a bag in the trash. Most people won’t object to getting two presents in one, especially when the bonus present is a soft, cuddly blanket. Place your gift on a flat blanket, then tie all of the corners together for a fun wrapping idea. 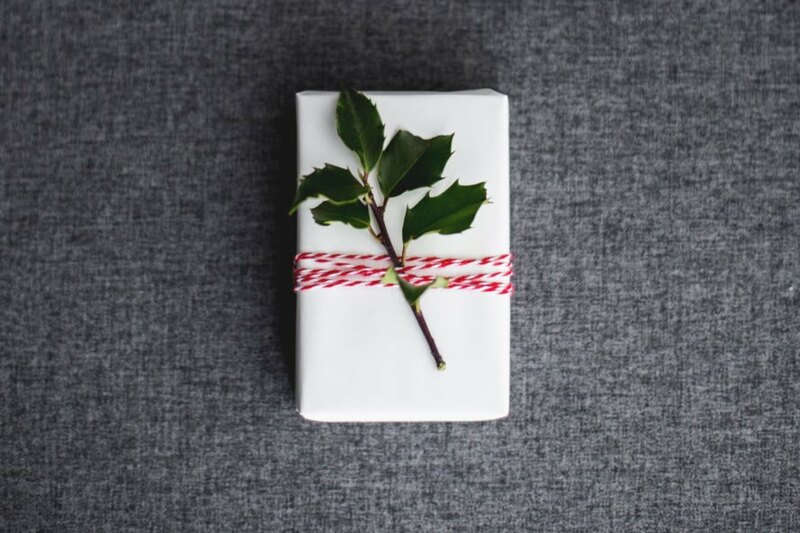 Try this unique alternative to traditional wrapping paper — plantable paper. This innovative gift wrap is made from post-consumer materials and is completely biodegradable. The paper is embedded with seeds, which sprout into flowers once the paper is planted. Keep your tape use to a minimum by using twine or hemp to tie up your packages. With a simple spool of string, you can tie up all of your presents that you wrap in newspaper, paper grocery bags or butcher paper. This strong material can easily tie up your gifts, and you can find rolls and rolls of it for just a few bucks. Leather cord also comes in a variety of colors, so it will easily dress up plain paper. If you have pieces of fabric that aren’t large enough to wrap an entire gift, you can use those pieces to decorate a plain package or jar. Cutting up some long, narrow strips of fabric is an easy solution for jazzing up gifts, and it keeps your gift wrapping to zero-waste. Thrift stores are loaded with brooches and bracelets that you can buy with the change in the bottom of your purse. There are many beautiful jewelry options that you can use to add some sparkle to your gift wrapping when you tie them with fabric scraps or cloth napkins. This option is beautiful, smells amazing and is also compostable. Simply tie some cinnamon sticks with string — and add a little greenery like pine needles or fresh herbs — to give your gifts an extra dose of holiday cheer. Find fallen leafy branches from evergreen trees, pinecones, winter berries or twigs to adorn your packages. Simply tie them into place with twine, hemp, leather cords or fabric scraps for an impressive, thoughtful touch. Don't contribute to the piles and piles of waste from wrapping paper this season. Instead, try some of these zero-waste techniques. Use recyclable paper, fabric, glass jars or blankets to wrap gifts. For an extra dazzling touch, embellish gifts with natural cords and ties, fabric scraps, old jewelry or natural elements. How will you wrap gifts this year?